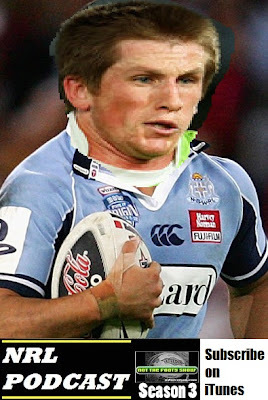 ... plus Luke Lewis, Mitch Achurch and the Robbie Farah battle with Matt Johns from NRL on Fox. 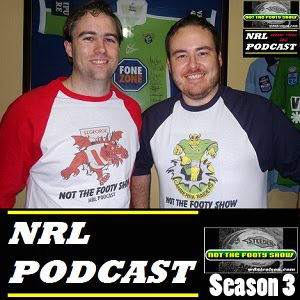 Get all the expert tips for Round 5 on NOT The Footy Show's NRL Podcast. Warrick Nicolson is joined by Matthew Duncan, Maria Tsialis, George 'GT' Taylor and yes even Nic McInerney to discuss Robbie Farah getting ripped by Matt Johns, Australia's potential ANZAC Test Team, Phil Gould leaving Twitter, Channel 9 finally showing games live in non-NRL states and the latest on the Bradford Bulls folding situation. Eyes gives it to his uncle for tipping against the Raiders and we Preview Round 5 and the panel gives all their tips and Special Fried Rice selections. At just over an hour long - there's no excuse not to give NOT The Footy Show a try at some point in your life. There will be no Monday review show this week - we are saving our 100th Show for Round 6 - Wednesday April 4th at 8:15pm. Listen to the Podcast for details on how to help choose our Guest. Last week, the defending premiers were toppled in the comfy confines of Shark Park and the Roosters became the worst 2-1 team in NRL history. Can anyone topple the two undefeateds in Round 4? For more on Round 4, check out the Podcast and Preview below. PAR +2.5 | GAME STATS | @ Parramatta Stadium, Parramatta. 7:45pm Kick-Off. Warrick Nicolson and Nigel Wilbow. Follow #NRLTweetPOTY for every Vote in 2012. Parramatta are 0-3 and 16th, Penrith are 1-2 and 12th. Penrith won both games last year, and have won 4 of the last 6 since 2008. PAR: L Burt, K Sio, R Morgan, W Tonga, C Blair, B Roberts, C Sandow, T Mannah, M Keating, M Allgood, N Hindmarsh (c), T Lasalo, R Maitua. Bench: C McGuire, FF MoiMoi, J Poore, J Paulo, P O'Hanlon. PEN: L Coote, E Uaisele, M Jennings, B Tighe, D Simmons T Burns, L Walsh, S McKendry, K Kingston, T Grant, N Smith, C Newton, L Lewis (c). Bench: D Galea, D Weston, B Austin, R Simpkins, C Ciraldo, M Achurch. Listen to the Podcast for a full preview, but we like the Eels - they may have sucked deluxe so far this season but the Panthers haven't looked impressive either. This is a game that the Eels somehow win even when they aren't any good, and Penrith drop games just like this when they are expected to win. SMH and Other Late Mail - Jarryd Hayne may be a very late inclusion, with a quicker than expected return from a knee injury. Cameron Ciraldo is out with a shoulder injury, while Tim Grant is reportedly a late withdrawal. The Hayne decision will come at approx 6:45pm. Adam Cuthbertson and Darius Boyd interviews headline our Round 4 Preview. Get all the expert tips for Round4 on NOT The Footy Show's NRL Podcast. DC Chapman and Warrick Nicolson are in the studio and are joined by regular guests Matthew Duncan and George 'GT' Taylor to discuss Tony Williams' dangerous tackle, Willie Mason not joining the Wests Tigers, Which teams can we write off as premiership contenders already and the $2 OAK Milk/Hot Dog deal at Penrith Park. 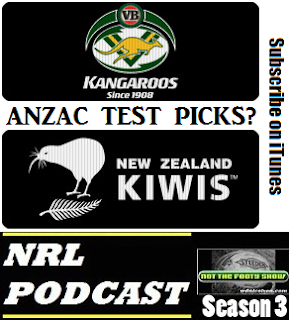 Eyes also makes his regular appearances as we Preview Round 4 and the panel gives all their tips and Special Fried Rice selections. We'll be back on Monday night for our Round 4 Review Show. We told you Cronulla would beat Manly! ... pity we didn't actually pick them. Get your full Round 3 Recap with NOT The Footy Show's NRL Podcast. Matt Duncan and Warrick Nicolson team up to dissect all the action from Round 3, talk about Dave Taylor's switch to the Titans and hand out all the NRL Tweet Player of the Year Votes. Find out why your team won or lost this weekend. We also update the panel's Special Fried Rice picks and their tipping results for Round 3. We'll be back on Wednesday night for our Round 4 Preview Show. In Round 2, the Dragons folded and the Dogs barked... in other less surprising news, the Eels and Titans are still ordinary. Welcome to 2012. For more on Round 3, check out the Podcast and Preview below. EVEN LINE | GAME STATS | @ WIN Jubilee, Kogarah. 7:45pm Kick-Off. Justin Davies and Greg Delaney. Follow #NRLTweetPOTY for every Vote in 2012. St.George-Illawarra are 1-1 and in 13th, Wests Tigers are 1-1 and in 10th. The Tigers won 2 of 3 in 2011, including the semi final in week 1. The Dragons have won the past 3 games at WIN Jubilee. WTG: T Humble, B Ryan, B Ayshford, C Lawrence, J Reddy, B Marshall, T Moltzen, A Woods, R Farah (c), M Groat, A Blair, G Ellis, C Heighington. Bench: L Fulton, B Murdoch-Masila, M Bell, S Meaney, J Moors. Listen to the Podcast. More written preview Friday morning. SMH and Other Late Mail - Matt Cooper and Beau Scott remain in some doubt, Nathan Green will play if one of them is out. Gareth Ellis is unlikely to play due to a corked thigh.